Recently, the main part of Longhai Yue port Children Park has been basically completed, and related supporting facilities have also been purchased. The project is being carried out and is expected to be open to the public in October. 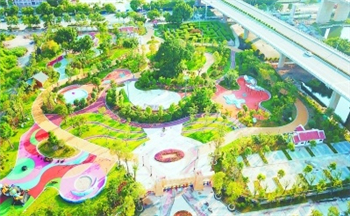 It is understood that Yue port Children Park is the first children's theme park in Longhai, with a total investment of about 27 million CNY and a planned land area of about 66,000 square meters. It integrates natural landscapes such as waterfront, wetland and plant greening, and has a zero-depth paddling pool, play bunkers, climbing and expanding area, children slides and other facilities. The park adheres to the design principle of “safety and environmental protection” and is divided into different functional areas, setting up children's entertainment facilities such as lawn, water area, play area, plant maze etc. The park is built with trees and vegetation as background. Through colorful fairy tale elements and entertainment facilities filled with childlike fun, it creates a world of entertainment that combines children's entertainment, leisure experience and science education. Children of all ages can feel the beauty of nature and grow up healthy and happy in chasing and running. At present, this project has entered the final stage and is expected to open to the public before and after the National Day this year.